Inbreeding has long been acknowledged as a cause of birth defects. It’s also a subject of taboo. Therefore, when the subject comes up in conversation it’s almost always quickly blown off with a joke. 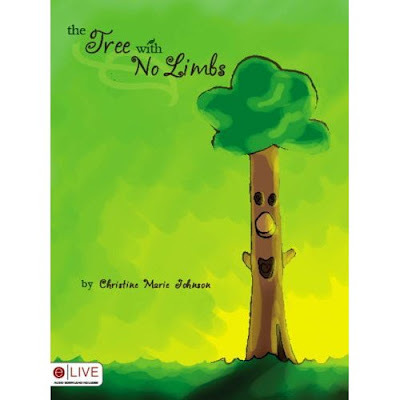 An excess of limbs or a question of mental capacity are the two most common vectors. Yet, the true effects of keeping it in the family can be invisible to the eyes and ears. A slim genetic pool is never a good thing. Even when it seems inbreeding has left the offspring with no issues, chances are fairly good something isn’t quite right. But with a lack of obvious evidence and an unwillingness to discuss it, issues often go unnoticed until it is too late. One of the common hidden genetic problems derived from inbreeding is the inability to have offspring. 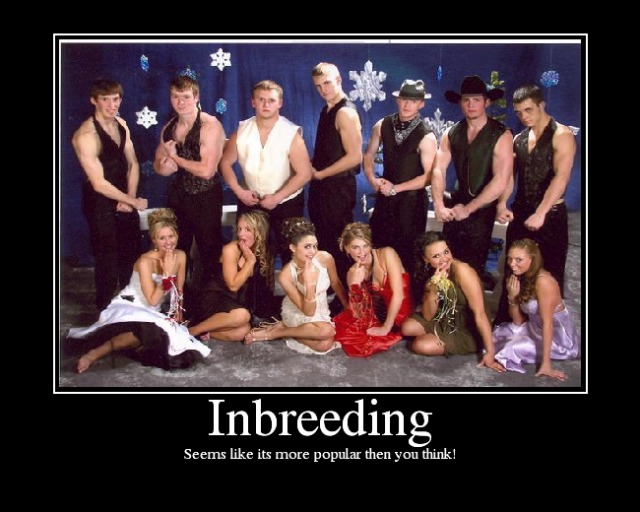 In other words, inbreeding can and does cause infertility. If not pure infertility, it can cause issues with pregnancy that prohibits fetuses from reaching full term. This, perhaps more than any other defect, can quickly lead to the demise of a species; a genetic free-fall. Amazingly though, in human societies, if inbreeding goes on long enough it sometimes becomes part of the culture. Embraced by peers and even seen as a positive, it is one of the more bizarre displays of “civilized” behavior. Combine a genetic free-fall with the embrace of inbreeding and you have a problem; an aviation problem. It’s hard to believe aviation could suffer from either of these issues. Yet, I believe it has both. Look through your binoculars across the broad aviation savanna and what you’ll see looks perfectly normal. Study each pocket of life in detail though and you’ll almost always find something that looks a lot like inbreeding. There are the airports that have 30 planes and eight of them are Stearmans. We’ve all seen our share of RV country clubs. And as we all know, there’s the option of warbirds, antiques, and homebuilders too. But, what about our groups? Aviation can be so unwelcoming of any diversity that our groups have paired off into sub-groups. Each of them promoting cultural inbreeding to the point they become loony with their ideas, rules, and requirements for acceptance. try it and it'll be offensive. Naturally, there can be reasons for an unbalanced ratio of aircraft types at an airport. Specific models of airplanes often converge on a point because of access to a knowledgeable mechanic or availability of parts. But in today’s world of overnight shipping and internet know-how, can we really believe there were seven people in a community of ten pilots who specifically wanted a Champ and the only thing holding them back was the right mechanic coming along? No. More often it comes from a desire to be part of the group. It is this desire which leads to inbreeding. External factors can also cause low genetic pools. With the economy being what it is, the expense of all things often means you have to choose one major hobby. This results in us having contact with fewer people of other interests. And since our hobby rests inside a protected area, our genetic pool sets sail from an artificially shallow body of water. It’s another trigger for genetic collapse; one of many. Obviously, aviation has a reproductive problem; one that seriously threatens the future of the sport. But, how do we fix it? What's the solution? It certainly isn't aviation’s current tactic - BLAME IT ON KIDS. Yes, that’s right. Kids these days are the problem. How dare they not have an interest in our sport? They should want to come crawling to lick our boots for a ride. They have no respect for the generations before them. And those games they play; when we were kids our parents forced us outside. Today they won’t even offer to wash my plane for a ride. Many of them don’t even see heroes when they look at us. Have they no idea how cool we are? Kids; who knew that kids would bring down the greatest sport of freedom in the world? And who in the hell would have ever predicted kids would someday come into existence without parents? Amazing things are happening aren’t they? Nope. People seem to forget that kids come from parents and parents come from grandparents. Ultimately, this means you are to blame, not the kids. You did this. But, it’s so much easier to blame the kids; those miracle babies who appeared out of thin air to become a generation which has no respect for elders, doesn’t trust institutions, and refuses to go outside. HOW DARE THEY!?! Myself, I often go through handfuls of non-aviation magazines, each representing different cultures, hobbies, or interests, reading only that foreword letter. Doing so gives me instant insight into a broad spectrum of society and a feeling for what each niche is feeling. One I often refer to is in Hemmings Sport & Exotic, written by David LaChance. I like David’s work for many reasons. It represents another but different sport of freedom, always attempts to look at ongoing issues from a point of reality, and regularly forces the status quo’s status to be reconsidered. While reading his April 2015 piece, “Cars and the Youth Movement”, I was struck by its perfect relevance. WOW! Right on the nose, right?! He described kids perfectly. Correct? WRONG! LaChance actually goes on to discuss how MTV the company has branched out from the business of streaming music videos to young folks. Today they also have a research side that studies them in detail. The corporation, long knowledgeable about generations of youth, has therefore become a great resource of real statistical information about them; information which often flies in the face of accepted reality. 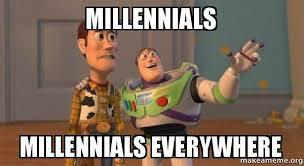 Quoting data from an MTV study titled, “Millennials Have Drive,” his letter to his readers shows that damn near everything they believe about young people is wrong. Your status quo, jump on the bandwagon, blame it on the kids whining is essentially baseless. And there’s no reason to believe the results would be any different with aviation. So where does that leave us? Well, it leaves us with an uncomfortable reality. The real problem is us. Aviation has been, for too long, a group of groups doing less and less to effectively promote and revive aviation. We’ve developed clicks that brush off outsiders, been poor stewards of the spirit of aviation, and have never put any real thought into the future. And yet, the real issue runs deeper than that. As parents, and elders, we have failed. We have actively embraced technology as daycare, given children everything with nothing expected in return, have treated them like friends instead of youngsters in need of direction, made them believe everything is dangerous, and even restricted their lives to the point of insanity for fear of them being hurt or dying. These are all selfish things. Don’t want to put out the effort to control your kids, give them a phone. Want to be known as the cool parent, be their friend. Don’t ever want to experience the pain of seeing your child hurt; never let them do anything so it never comes to that. It’s crazy and it’s lazy but one thing is worse; raise kids the way I described and then blame them for the outcome. That is what society is doing. Yet, despite all the efforts to make them worthless, these kids still have a drive to be good citizens, live life to the fullest, and be successful and all you’re doing is pointing the finger their way. If I were them, I wouldn’t trust you, I wouldn’t trust any other institutions, and I certainly would not want to come to the airport to hang out with you or learn to fly. Instead, I would probably find a video game that puts me into scenarios that move at high speed, cut across state lines and cultural divides, rewards me for excellence, and ultimately puts my life (in the game) at risk. You see, the games and electronics are merely replacements for what we’ve kept them from. The phones connect them openly to new friends when barriers exist elsewhere. And as for that lack of respect, well, respect is earned, not given. Technology has giving them a way to block out the people who have screwed them over and to do the things you wish to keep them from. The saddest part of this though may be the most ironic. It is the parents who, with the embrace of technology and media, chased each other to the bottom. Every new generation following the latest trendy parenting book; each new generation of parents attempting to show everyone how cool a parent they were; every generation giving their kids more for less; each generation forgetting that the hardest times produce the people of most character. 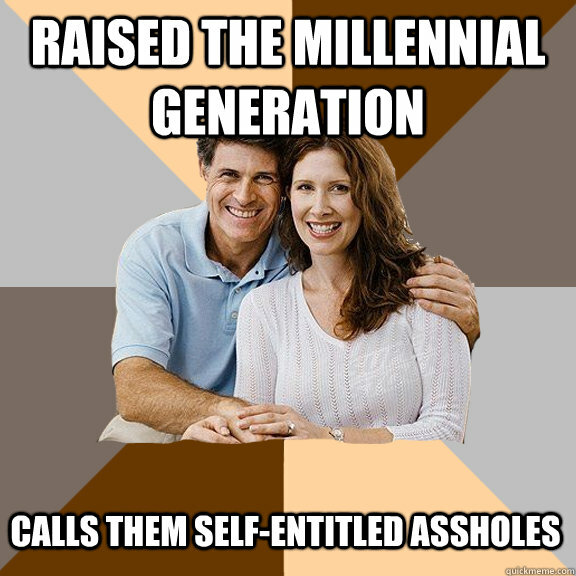 And, as always, each generation has blamed it on their children. I applaud people like David LaChance for looking outside of his industry to find answers. Often the results are uncomfortable. Almost always they are valuable. In this case, the findings shut down what may be the most pervasive myth about Millenials and forces people to think. If it’s not the kids’ fault, whose is it? Without the correct answer to that question, it is impossible to answer the next; how do we fix it? One thing is for sure. If we keep looking inside the clan for answers, we’re not going to find them. "I promised that i'd never let anything happen to him!" "Hmm.That's a funny thing to promise"
"Well, you can't never let anything happen to him. Then nothing would ever happen to him. Not much fun for little Harpo"